Drinkwater (left) has made four appearances for Chelsea this seasonChelsea midfielder Danny Drinkwater declined an England call-up but manager Gareth Southgate says any talk of club-versus-country rows is "nonsense".Drinkwater is lacking fitness and news of his decision comes after six players pulled out of Southgate's squad for friendlies with Germany and Brazil. "The players are injured and cannot play," Southgate told BBC Radio 5 live. "I am not a manager who wants to reel players out until they break. I don't take risks with players. "He added: "I have man-to-man discussions with them around where they are at and how much risk we want to take. "Hearing this talk of club v country, it is a nonsense. "Drinkwater joined Chelsea from Leicester on transfer deadline day in August but only made his debut for his new club in late October because of a thigh problem. "I spoke to Danny earlier in the week but he feels he is not fit enough to play," Southgate added.Tottenham's Harry Kane is among the six withdrawals but his club manager Mauricio Pochettino has confirmed the striker is "OK" and "available" for the Premier League trip to rivals Arsenal on 18 November.Raheem Sterling, Fabian Delph, Jordan Henderson, Dele Alli and Harry Winks are the other players to have pulled out.Meanwhile, Chelsea defender Gary Cahill was the only player missing from training on Thursday morning. Two England Under-20 internationals - Tayo Edun of Fulham and Jay Dasilva, who is on loan at Charlton from Chelsea - were invited to take part in the session.Crystal Palace midfielder Ruben Loftus-Cheek, 21, will reportedly be given his England debut against Germany on Friday (kick-off 20:00 GMT). Southgate's side face Brazil at Wembley Stadium next Tuesday (20:00). Drinkwater has played just one hour and 43 minutes of football this seasonBy Ian Dennis, BBC Radio 5 live senior football reporter at St. George's Park:Only Danny Drinkwater can gauge his own fitness levels but one wonders whether he may regret his decision over time. 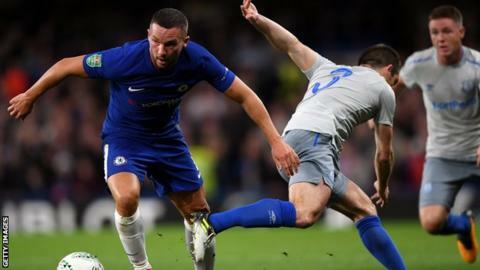 Troubled by a calf injury, Drinkwater did take another knock to his calf against Manchester United on Sunday and I am told as a result he is being treated lightly this week at the training ground in Cobham. Bear in mind he arrived at Chelsea with a thigh problem so you can understand the need to get fully fit - he has only played one hour and 43 minutes of football this season. However, Danny Rose is also not 100% fit after a nine-month lay-off and was desperate to be back involved with England. He spent two days doing recovery at St George's Park before training on Wednesday. The reality for those who are not with England means there is an opportunity for others. Time is in short supply to impress Gareth Southgate because from March the England manager will look to narrow things down and focus on the group who are likely to be taken to Russia for the World Cup. Scotland and England players wore black armbands with poppy symbols during their World Cup qualifier at Wembley last NovemberThe last meeting between England and Germany in March was marred by a section of England supporters booing the German national anthem and singing chants referencing World War Two.Football Association chairman Greg Clarke described the behaviour as "inappropriate, disrespectful and disappointing", while two supporters' club members were issued lifetime bans for making Nazi gestures.This match will see both sets of players wearing black armbands bearing poppies. "We have moved on from those times. People who do that don't represent us as a team," said Southgate. "We are talking about individuals. The vast majority support us brilliantly. "Germany have agreed to wear a poppy for this fixture. That is something that should be noted." Bierhoff scored 37 goals for Germany, including two in the final of Euro 96 against Czech Republic at WembleyGermany's general manager Oliver Bierhoff says the World and Confederations Cup champions cannot "let up for a second" as they look to defend their crown in Russia next year.The former AC Milan striker said: "We can't rest on our laurels after the successful qualification campaign and the Confederations Cup win. "It is completely different at a World Cup. We are the ones being chased. We can see what is going on in countries around the world. England are the Under-17 and Under-20 world champions, and France and Brazil have also been improving massively. "Everyone will be watching us and will want to knock us off the top. We know the great potential we have. "Southgate added: "I spoke about enthusiasm about our youth and our Under-17s will be there with their World Cup trophy - that will be a nice moment for everybody. "They will be games our supporters will look forward to seeing not just us but the opposition as well." Goalkeepers: Jack Butland (Stoke City), Joe Hart (West Ham - loan from Manchester City), Jordan Pickford (Everton).Defenders: Ryan Bertrand (Southampton), Gary Cahill (Chelsea), Joe Gomez (Liverpool), Phil Jones (Manchester United), Michael Keane (Everton), Harry Maguire (Leicester), Danny Rose (Tottenham), John Stones (Manchester City), Kieran Trippier (Tottenham), Kyle Walker (Manchester City).Midfielders: Eric Dier (Tottenham), Jesse Lingard (Manchester United), Jake Livermore (West Brom), Ruben Loftus-Cheek (Crystal Palace - loan from Chelsea), Ashley Young (Manchester United), Jack Cork (Burnley).Forwards: Tammy Abraham (Swansea - loan from Chelsea), Marcus Rashford (Manchester United), Jamie Vardy (Leicester).